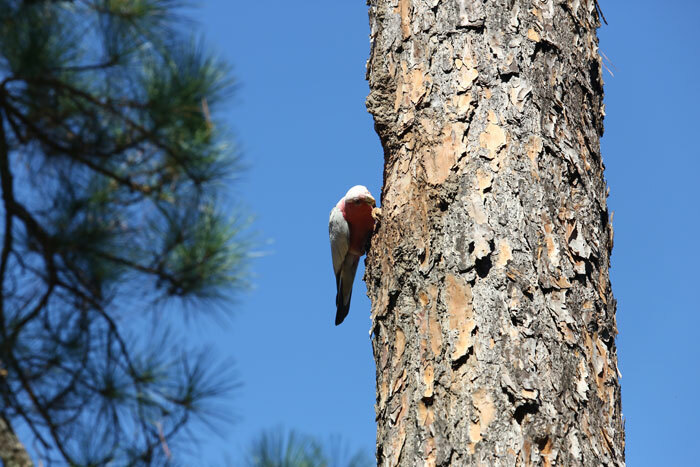 At our May 2016 Dawn Road Reserve Bushcare working bee, volunteers were treated to a special encounter with a pair of delicately coloured birds who seemed quite interested in what we were doing but not at all put off by our presence. 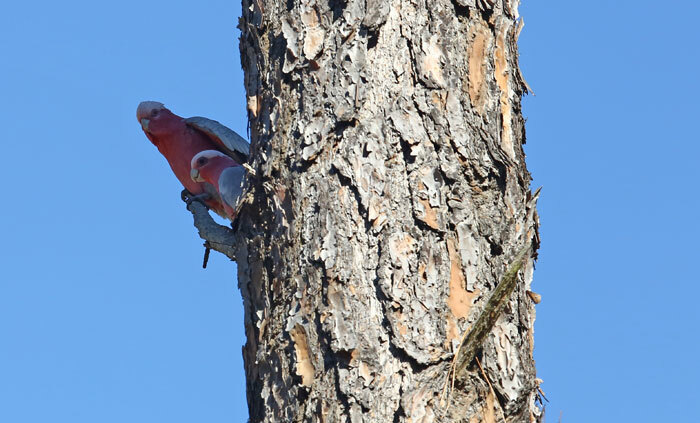 With their rose-pink head, neck and underbelly, a paler pink crest with a grey back, wings and undertail, they were both galahs (known as either Eolophus roseicapillus or Cacatua roseicapillus), a vocal member of the cockatoo sub-group of the parrot family that is prolific across Australia. 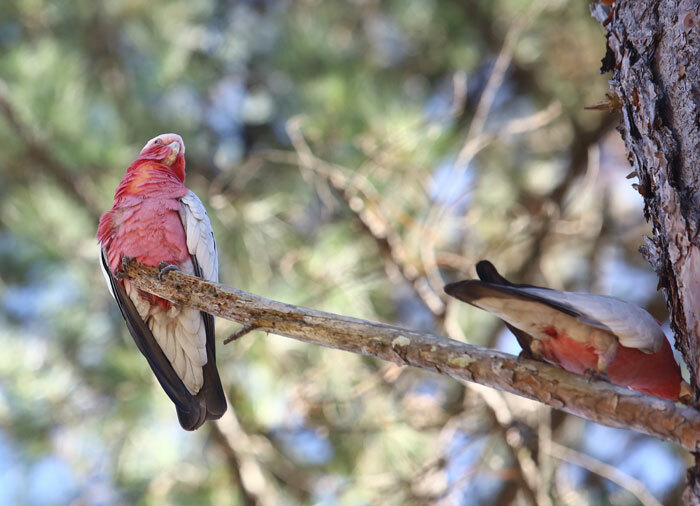 Weighing from 270g to 350g and measuring up to around 35cm in length, galahs are usually found roosting in large flocks at night near timbered habitats, usually near water. However, within those flocks, individual pairs typically mate for life – only taking a new mate if the other dies. 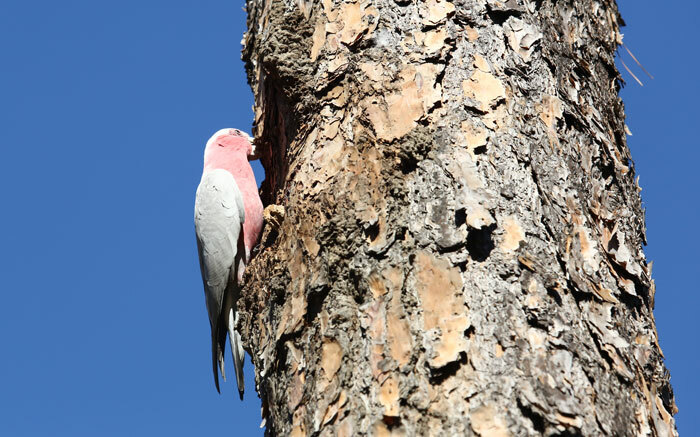 Galah pairs will nest in a tree hollow or somewhere similar and they will line their nest with leaves. Both adult birds will incubate their eggs, which hatch in around 25 days and the parents will continue to care for their young until they fledge after about seven weeks. Those birds that survive can live up to 80 years if their food supply is plentiful and of good quality. During the heat of the day, these birds spend most of their time sheltering in the foliage of trees and shrubs. These distinctive birds feed mainly on grass and cultivated seeds collected from the ground, so they can become pests in agricultural areas, where their numbers are still substantial. However, they are becoming more abundant around areas of human habitation where food and water are available. 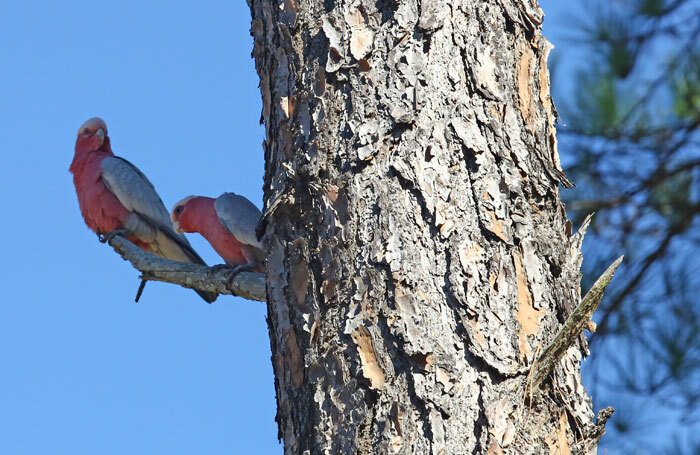 In the wild, the galah’s call is quite high-pitched and distinctive ‘chi-chi’ and occasionally persistent squawking. Oddly enough, galahs can easily breed with other members of the cockatoo family, including sulphur-crested cockatoos, corellas and cockatiels. They have also become popular aviary birds and some birds seen in and around the suburbs will have escaped from their residential enclosures. As pets, galahs are great mimics, like their cockatoo cousins, and both males and females can pick up and replicate sounds and words quite quickly, as this YouTube video shows. Oh, and if you’re new to Australian idioms, the colloquial term ‘galah’ refers to someone who is behaving stupidly. NOTE: Follow this link to catch some more shots of these galahs.